Walking down my local high street, there are several independent jewellery retailers and I I often go window shopping. The window displays are full of delicious jewellery; rings for weddings and celebrations, delicate silver and gold chains, white pearls, the occasional peacock blue strand of pearls, diamond earrings, rubies, emeralds and sapphires. I feel safe that I recognise the stones; I know what I’m getting. Am I excited? To be honest, not really. Don’t you get a little bored and feel blasé about the steady cocktail of blah blah jewels. Ok a mega pink diamond, the rarest Padparadschah Sapphire can get the pulse racing but I would need the bank balance of a Russian oligarch to be able to regularly treat myself. I don’t want to rely on a wedding ring to be my only foray into the gem collecting arena. 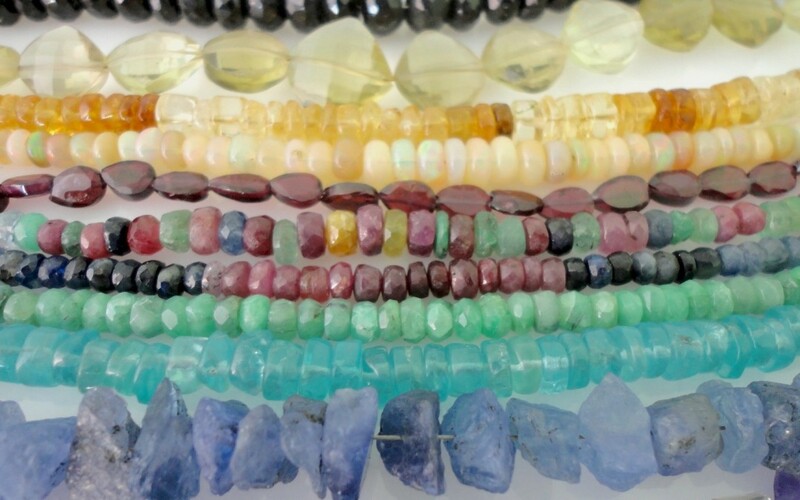 I want to experiment and wear real gemstones that are in the bright colours of the rainbow, or subtle pastel hues and the hundred other glorious colours that reflect the splendour of the natural world. Why can’t we go down the high street and experiment? Perhaps I should be thankful that I can get fake stones that mimic nature’s grandeur. I can get something in a high street chain store that is the same colour as rose quartz but it’s not real. I can get a necklace of blue stones that are not lapis lazuli. However, depending on the store, the prices could be almost the same as those for real gemstones. I’m lucky that I do have a selection of unusual gemstones that I have sourced and use in my jewellery designs. But why aren’t high street jewellers a little more adventurous? I feel they should look to educate customers on the beauty of gemstones other than the big five. Yes, I know that the diamond industry invests millions in promoting diamonds. Even crystal companies now spend outrageous amounts on promoting cut glass jewellery. As a result we spend almost as much and often more on glass than natural genuine gemstones. Is it laziness? Are high street jewellers content to peddle the recognisable stones as they are guaranteed a big mark up on the prices? We as customers have been trained to expect to pay large sums for those gemstones. So just like perfume and make-up we end up paying more because of the marketing, promotion and packaging. What’s Ametrine? Ametrine is a quartz stone that has sections of Amethyst and Citrine, both stones that we’ve heard of. But Ametrine… it’s a stunning delicate mix of regal purple and subtle sunshine yellow. How about a really feminine lilac stone with hints of pink? Kunzite is a delicate stone that sparkles in the sunshine when faceted. Kunzite is so special it was chosen as one of the premier gemstones in the Tiffany “Legacy Collection” to commemorate their 175th year anniversary. President Kennedy purchased a 47 carat Kunzite ring for his wife Jacqueline. I can’t remember seeing a Kunzite ring in the high street. Find out more in my blog Kunzite *The Woman’s Stone”. I have Kunzite in my collection, you should be able to have it in yours as well – and you don’t need to break the bank either. Have you any Iolite, once known as the “water sapphire”? The name Iolite comes from the Greek ‘ion’, which means violet. Iolite is usually a soft purplish blue when cut properly. What’s interesting about Iolite is not just that it’s an affordable natural gemstone; it has properties that the Vikings were quick to exploit. The Vikings used Iolite to navigate their way to the New World and back. By looking through a thin slice of Iolite the Vikings used it as a lens to determine the exact position of the sun, and navigate. The unusual quality of this gemstone is its extreme ‘pleochroism’; it has different colours in different directions in the crystal. A cube cut from Iolite if cut correctly will look violet blue from one side, yet on another side it can be clear as water and from the top it has honey yellow hues. So when you’re next looking for a new piece of jewellery why not ask for something different? Or check out my website? In my next blog I will continue looking at unusual but beautiful natural gemstones. Hopefully this will be the start of your journey of discovery to affordable luxury.